Give guests at your hotel, resort, or poolside bar a place to kick back and relax with this Grosfillex 99101019 / US101019 Nautical adjustable sling chaise! 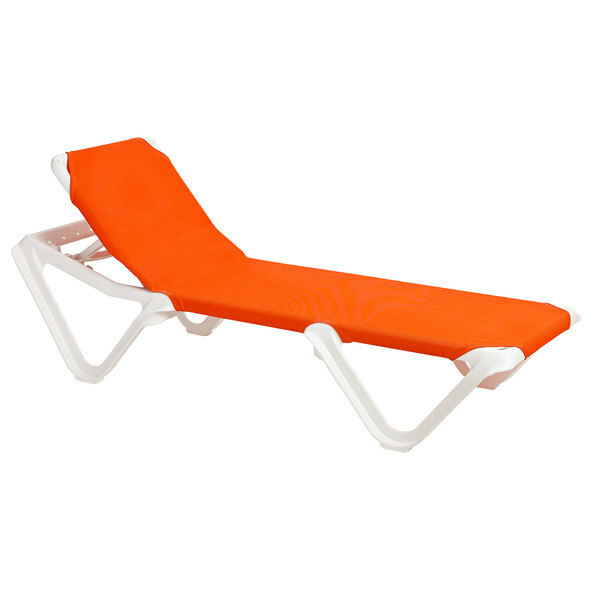 This chaise lounge chair features an attractive white resin frame that adjusts easily for a quick poolside nap, relaxing with a drink, and anything in between. With a 3-poisition adjustable back, your guests can customize this chair to best fit their needs. The vibrant orange sling provides unbeatable comfort and a splash of color to your outdoor furniture. Designed with a mesh sling, the fabric resists mildew, mold, and fungi and its elastic construction is great for shape retention. It's also impervious to salt air and other common stains so you can keep your fabric looking clean and new. The commercially-rated construction provides superior durability and comfort for a long-lasting addition to your establishment. It's UV resistant to help prevent fading and discoloration by the sun longer than retail-grade plastic furniture, providing multiple years of reliable use. For added convenience, the sling cleans easily with a mild liquid detergent solution.